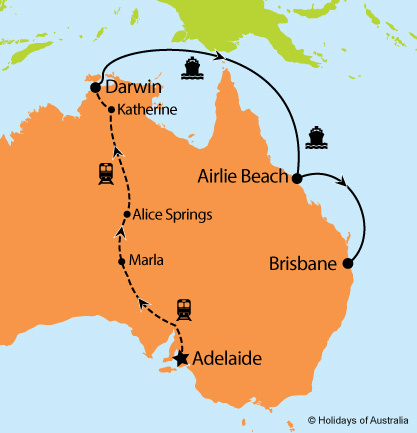 Enjoy the comforts of rail travel aboard The Ghan to Darwin. Travel to Kakadu National Park and witness historic Aboriginal rock art dating back thousands of years. Discover the pristine waters, beaches, rainforest & the Great Barrier Reef from Airlie Beach. Unpack once as you cruise aboard the Pacific Dawn. ^Save $200 per booking offer is available on new bookings only and has been applied to the advertised price. Valid on bookings made & deposited by 31 May 2019. Travel insurance voucher must be used within 7 days of booking, is valid only when booked with Holidays of Australia & the World and is not redeemable for cash or any further discounts. Images courtesy of Tourism NT, GSR, Peter Eve & P&O Cruises.